This easy cream cheese frosting is fluffy, tangy, extra creamy and super smooth. It thick enough to pipe onto cakes and cupcakes, and tastes delicious on so many cake flavors – whether it’s carrot cake, red velvet or more. 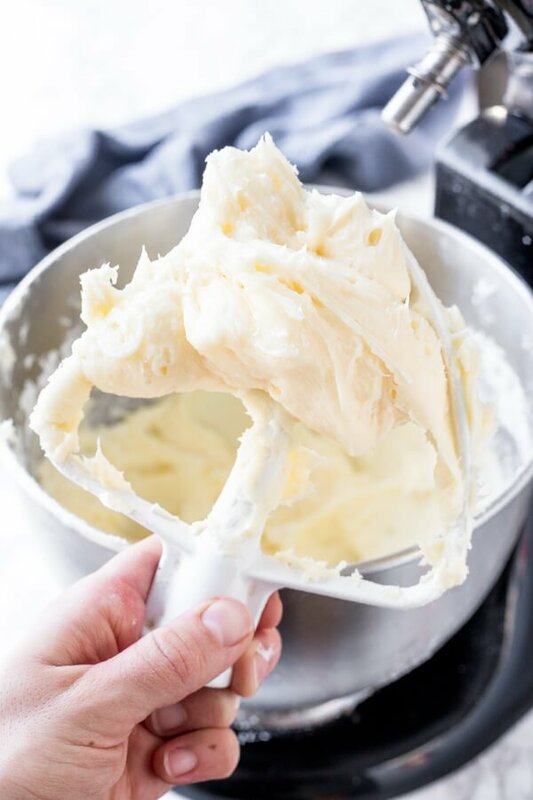 Learn all my tricks on how to make cream cheese icing that turns out perfectly every time. I use this recipe in my kitchen all the time because it’s simply the best cream cheese frosting ever. Cream cheese frosting needs to be fluffy, super creamy, not too sweet, and just a little tangy. The tanginess of the cream cheese cuts the sweetness, which makes cream cheese frosting the perfect buttercream recipe. (In my humble opinion). With cream cheese frosting you never need to worry about getting a sugar headache like you can with regular buttercream – and it seriously tastes delicious on just about anything. Making cream cheese frosting is actually really quite simple. There’s only 5 ingredients. However, there’s actually a lot of areas where things can take a turn for the worst and your frosting can go from thick and creamy to thin and grainy pretty easily. 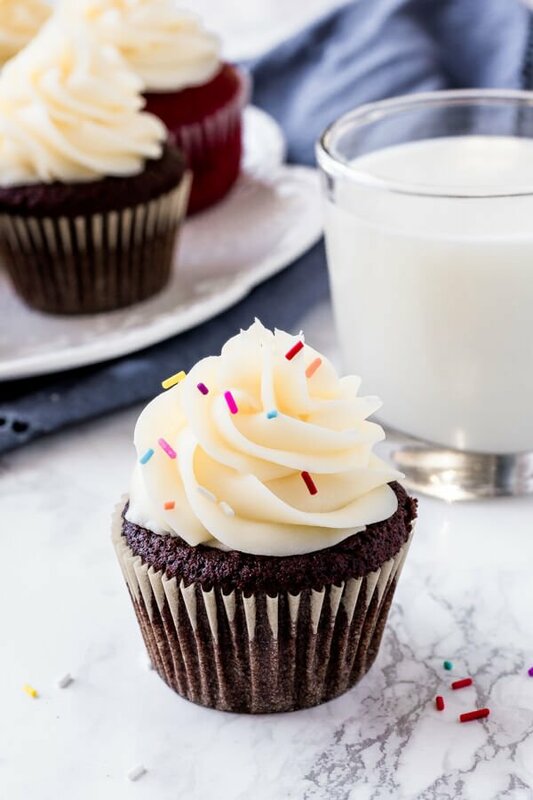 So don’t despair – I’m sharing with you ALL my tips for how to make cream cheese frosting that holds its shape so you can easily pipe it onto cupcakes and cakes. Ok – please don’t feel intimidated with the number of tips…. I promise they’re very straight forward, and if you follow them you’ll end up with the most delicious frosting. Use real butter, not margarine. Salted is ok, but you’ll likely want to leave the salt out of the recipe. The butter and cream cheese should be softened to room temperature before getting started. They shouldn’t feel cold to the touch. If you press your finger into the butter- it should have some give, but it shouldn’t be melty or overly soft. Room temperature ingredients ensure that your frosting is lump free and that you don’t have to over mix the ingredients (which can also cause frosting that’s too thin). Full-fat, brick-style cream cheese. Lite cream cheese or spreadable do not work because they’re too thin. Sift the powdered sugar first for lump-free frosting. Beat the butter on its own for about 2 minutes until it’s very fluffy and looks lighter in color. Then mix in the cream cheese until just combined. Beating the butter first creams fluffier frosting, and helps minimize the risk of over mixing later (see below). Once the frosting is thick and you’ve incorporated the powdered sugar (or most of it) – stop mixing. If you continue to beat the frosting with your electric mixer you can over mix it and it will turn too thin. I know it seems counter-intuitive, but it’s absolutely true. Some cream cheese frosting recipes also call for cornstarch. The cornstarch helps to make the frosting even thicker without adding too much powdered sugar. 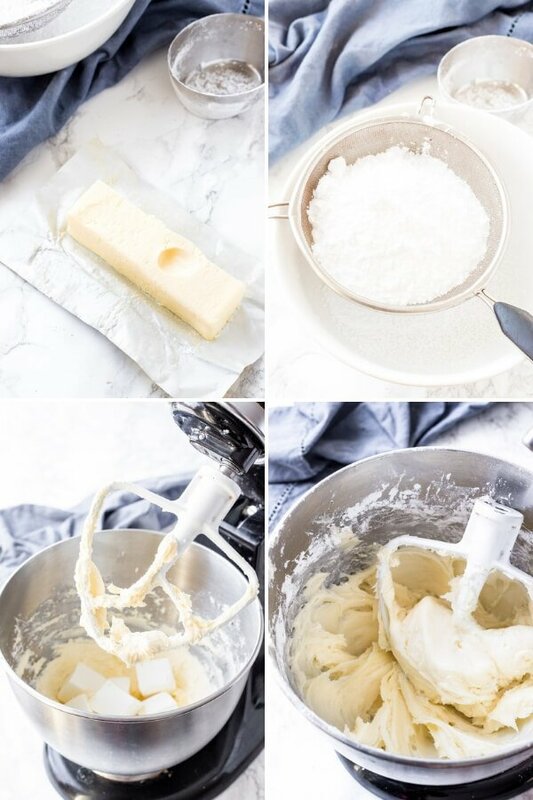 For cream cheese frosting with cornstarch that’s extra thick – sift 1/4 cup cornstarch with the powdered sugar. Then beat the powdered sugar and cornstarch mixture into the frosting just as you would otherwise. I often use this trick if I want to pipe cupcakes. Yup! Absolutely. I like to put the frosting into a freezer bag, remove the excess air, then zip it closed and pop it in the freezer. Thaw in the fridge (typically overnight), then bring it up to room temperature first. Re-whip the frosting so it’s smooth and creamy again, adding in a little extra powdered sugar or whipping cream as needed. Should Cream Cheese Frosting be Refrigerated? Cream cheese frosting can sit at room temperature (in an airtight container) for up to 8 hours as long as your kitchen isn’t too warm (above about 70F or 21C). Any longer than that (or if your kitchen is warm), store it in the fridge. Before enjoying bring the cake or cupcakes up to room temperature. Remove them from the fridge 1-2 hours before enjoying. 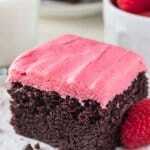 Or try this chocolate cream cheese frosting! This easy cream cheese frosting is fluffy, tangy, extra creamy and super smooth. 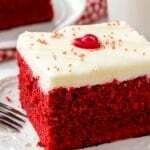 It thick enough to pipe onto cakes and cupcakes, and tastes delicious on so many cake flavors - like red velvet, carrot, banana cake and so much more! In a large bowl with an electric mixer beat the cream cheese until fluffy (about 2 minutes). Beat in the cream cheese until evenly combined. In a separate bowl, sift the powdered sugar and optional cornstarch. With the mixer on low, beat in the powdered sugar (and optional cornstarch) about 1 cup at a time. Turn off the mixer and scrape down the sides of the bowl as needed. Once the frosting seems thick, stop mixing. If it's a little too sweet for you, optionally beat in 1-2 tablespoons of whipping cream adding 1 tablespoon at a time. 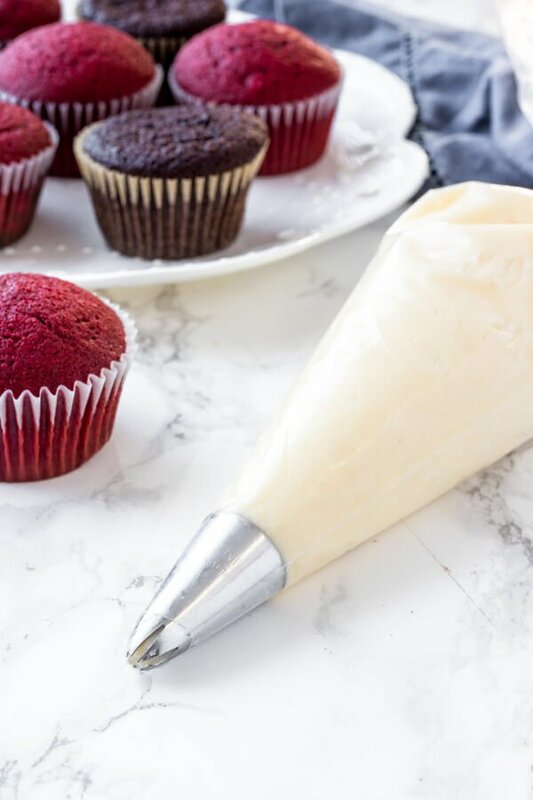 Transfer the frosting to a piping bag to decorate, or spread onto cakes or cupcakes with a flat knife. *Salted butter is fine. If using salted butter, remove the salt from the recipe. **Butter and cream cheese should be softened to room temperature. ***Frosted cakes and cupcakes can be stored at room temperature in an airtight container for up to 8 hours (if your kitchen isn't too warm). Then store in the fridge. Remove from the fridge 1-2 hours before serving.